Goodbye. Even Though You Will Always Be With Me. My Mum would hate being here today. Not just because of what it represents, but because she hated being the centre of attention. But I always wanted to put my Mum in the spotlight because I have always thought she was an amazing, inspiring and special woman. They are words that describe a beautiful character … but if I was to tell her that, she would give me a sweet smile before changing the subject. You see my Mum was an incredibly humble woman who didn’t think she was doing anything special. In fact, if you asked her what she was proud of, I would imagine she would say a maximum of 3 things. 2. Her attitude to life. But the fact is, everything she did was special. Not just in terms of her talent – of which some of you may be surprised to learn included being a wonderful painter and writer – but in terms of her generosity. There’s a reason why many of my friends are here today – and it’s not just because she always loved it when they filled the house with noise and laughter – it’s because she always was warm, open and kind to them. But in matters relating to me, my Mum’s generosity knew no bounds. From a personal perspective, I can tell you that I never wanted for love. I never wanted for support. I never wanted for encouragement. She gave me so much including teaching me what total, unconditional love really meant. For example, when Dad fell ill, she was adamant I should continue with my plans of moving to Australia. Of course part of her didn’t want me to go, and I felt the same, but she – and Dad – wanted me to live a life of discovery and fulfilment and they knew if I didn’t go at that moment, I may never leave which is why I hope the life I now lead repays their faith and love … though they may be more impressed by the fact I am wearing a suit, tie and shoes … which is something I didn’t even manage at my own wedding. But my Mum is no longer here. My Mum was going to go into hospital, get her heart fixed and enjoy a new lease on life. It is important you all know mum knew there was a risk. And as risky as heart surgery is, she knew it was not as risky as not having the operation. 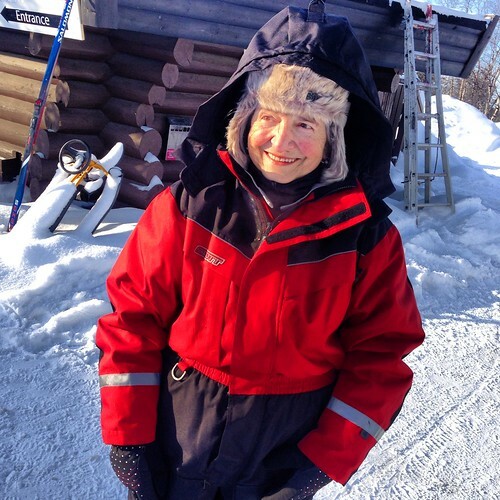 She loved walking, learning, travling, exploring – we had gone everywhere from China to the North Pole together – but her illness had curtailed most of the things she loved which is why any chance of changing her situation was a chance worth taking. And while the level of risk was relatively low – 10% – the reality is my Mum had rhumatic fever when she was a child and that is an illness that slowly – but continuously – attacks the heart. While most people with that condition still have a successful surgery, my Mum sadly had a complication that only 5 people out of 8000 have had and that resulted in this terrible thing happening to her. If there is anything to feel thankful for, it is that she didn’t suffer at all and knew I was with her. And while I am eternally grateful that we got to spend so much time together in the last 5 months – including spending New Year together – and I’d do anything to have her back with me … I cannot tell you how grateful I am for that ending and I know she would feel the same way too. While there is so much more I could say about her, I feel I need to say some things to the people in the church. To her family, especially Silvana, Chris & Selene. My Mum loved you so much. We were even talking about her maybe moving back to Italy as she loved the idea of being closer to you all. She would be so happy and honoured that you are here today. To her friends, especially June. Thank you for always being there. I know my mum was stubbornly independent but she always was greatful for the friendship and support you gave her over the years. To be honest, I don’t think she realised how many people thought so highly of her … but that’s because she didn’t realise how special she was. To my friends, especially Paul and Shelly. I can’t thank you enough for everything you did for my Mum and for me. We both appreciated it more than you could ever know. I don’t know if I will ever be able to repay your kindness and compassion but I will continue to try. My Mum loved you. She was so happy we were together, so happy I’d found you, so happy I had managed to convince such a beautiful, kind and thoughtful person to be my wife. I know you won’t understand what I’m saying or will remember these words … but you need to know that while my Mum didn’t get to hold you in her arms – something she desperately wanted to do – she held you in her heart and I’m so greatful that you made her last 3 months so full of happiness. You are a gift to all of us and I totally understand why she told your other Grandma that she rejoiced in your birth. And finally to my Dad. I know we are not a religious family, but I have to say I hope Mum is with you, especially as tomorrow would be your 51st wedding anniversary and you deserve to be together again. And so I come to the end of my dedication and all I will say is this. Thank you Mum. Thank you for everything. The kindness, the support, the care and most of all the love. You were a very special person and I miss you more than I will ever be able to express. The world is a better place for having had you in it, even if it is now a sadder place now you’re gone. You were – and are – a very special person. Comments Off on Goodbye. Even Though You Will Always Be With Me. So the last few weeks have been a bit of a blur. In some ways it seems like my Mum died only a day or so ago and in other ways, it seems like months have passed. I’ve come to the conclusion that all the legalities you have to go through when a loved one dies is really there to allow your brain to be preoccupied with paperwork and phone calls so your grief can be diluted and you can start coping with your loss. But it’s a false sense of coping because along the way you encounter little emotional bombs that bring it all flooding back. I’m not talking about the things like picking up her belongings from the hospital or washing her clothes – especially the ones you saw her wear in the hospital – or organising the funeral, you know that’s going to hurt, I’m talking about the things that catch you off guard. For me, night times have been the worst. When my wife and child sleep, my grief awakens. With nothing to occupy it, my brain goes into that dangerous area of remembering every detail of Mum’s final 48 hours … every word of the surgeons explanation … every conversation we didnt have … forcing me to face the unbelievable reality my dear Mum has died. But there’s other moments where the rawness of grief gets opened up. Moments that seem almost insignificant at first glance, but end up ramming home the horror of the situation you are living through. One of them has been organising our home phone number to be switched off. Yes, I know it is just a phone number but it has been synonymous with my life, my parents and my home for over 44 years. 6 little digits [which became 7 when the telephone exchange was running out of numbers] that in some way, represent my history. I know … I know … I am a sentimental fool, but to end my relationship with those numbers feels, in some way, that I am ending my relationship with my history and childhood. I must admit I did try and “buy” the number – offering to either pay to keep it or pay to have it retired – but the phone company told me I couldn’t, and they wouldn’t, do it. In some ways that’s good. It means I can not be held back by grief – as I let myself when my Dad died – but it’s hard. To be honest, if I had my way, I would have preferred to hire a security guard to stand outside my childhood home so I could keep it exactly as it is but in-keeping with the spirit and values my parents tried to instill in me, I’m having it refurbished so I can help a family move into an area that, like my parents did for me, can give their children a better chance in life. Next Tuesday all the furniture is taken out. Some of it if going to a storage facility so we can collect it when we’ve decided where we’re going to settle down but most is going to charity. All the thousands of books. Even though the house will stay mine [and the deal with the family we’re renting to is the gardens, my parents passion, must be maintained as they are] the fact is everything is about to change which is why next Monday night – the day before the emptying – my best friend Paul and his wife will come over for dinner to say goodbye to the old [something he was inherently part of] and hello to the beginning of the next chapter. But then there are moments that fall into a totally different catagory … moments that trip you up because you didn’t even know they existed. In these cases, they are specifically related to the life you had with your parents rather than the home you all lived together in. These are moments where you discover a side to your parents you didn’t know. Now I appreciate this has the potential to be a bad thing but in my case, it was something both beautiful and sad. As we were going through all the papers and the photographs, we discovered all manner of things. Every photograph they ever took of me, them and us. Every Mothers and Father’s Day card I ever gave them. All the messages my Mum received when Dad died. And while it was amazing to see them – as well as see how much Otis looks like I did as a kid [see above] there were 3 things in particular that set my emotions over the edge. Two were love letters written between my parents. One from my Mum. One from my Dad. They were written in early 1964 – before they were married and well before I came on the scene – and in them, you see all the love and compassion they had for each other. Of course I knew this because I saw it every day I was living with them … but this was different. This was when they were young. When they had less responsibilities. When they didn’t know what the future held but were excited by the possibilities. This was something I never saw and it was beautiful and precious. My Dad told my Mum that the last 12 months were a beautiful time for him. That finding someone to love and have them love him was all he ever needed. My Mum responded with excitement about how their life would be together and how she was grateful my Dad had found them a flat with a working fireplace in it as it would be cosy in winter and would keep them warm. It was achingly beautiful and utterly touching. And then I found a card. It was something my Dad sent my Mum on the day I was born. I always knew I was loved and wanted by my parents but this revealed just how lucky I was to have my Mum and Dad. To see this. To have a chance to glimpse into a time before I was around felt like a gift. Part of me wanted to keep these things but they were not mine to keep. They belonged to my Mum and they will go with her and I just feel incredibly fortunate to have been able to see them and re-experience the love that lived amongst them and us all. Don’t get me wrong, we went through some tough and challenging times – we certainly weren’t the Brady Bunch – but through it all was the certainty that we belonged together and valued that above all else. The other thing that is interesting is the loss of my Mum has reawoken the loss of my Dad. A friend of his – who I haven’t seen for 30+ years – came to see me last weekend to pay his respects to Mum. It was wonderful to see him but as he sat in the chair that my Mum sat in – and my Dad before her – I couldn’t help notice how similar his eyes looked to my Dad. It was strange. It was like he was back and when I reminded myself he couldn’t be, I felt a wave of sadness wash over me. I wasn’t the only one who felt that. Paul – my best friend – was with me and when my Dad’s friend left, he told me how much he had reminded him of my Dad … which might help explain why I felt such an overwhelming need to spend the last few days arranging my parents names to be honoured on flowers, plaques and park benches around the community where they lived. I guess what I’m trying to say is that for all the pain and sadness I’ve experienced in the last 14+ days – accepting there have been some moments of heart-warming love – the fact is it means I truly loved my Mum [and Dad] and while I know they wouldn’t want me to feel pain and sadness I’m going through, it’s the greatest compliment I can give them. On Friday it will be Mum’s funeral. It will be hard but it represents another stage of the grieving process. The celebration of an amazing person. I’m going to be a bloody mess. It started when I finally found Mum’s address book. For the past few days I’ve been so busy with the legal matters relating to her death, my brain has been preoccupied with making phone calls and filling in paperwork … however with the discovery of that little brown book, it meant I could finally contact the last of Mum’s friends and break the terrible news to them. Every call started with the same gentle conversation. Before they got to the question I dreaded. Every time, as the words informing them Mum had died left my mouth, I would breakdown. I tried not to – I really did – but it was as if my brain was listening to the words for the very first time each and every time. I felt so sorry for Mum’s friends. There was a slight delay between them hearing the news and hearing my tears before they understood what had been said and then the pain would hit them like a tsunami before we went through the very English thing of trying to make each other feel better. It was hard and emotionally exhausting but nothing compared to the other thing that happened today. This afternoon, I met the surgeon who operated on Mum. He wanted to explain why an operation that usually achieves such success failed on my Mum. Basically Mum’s heart was broken. When Mum was very young she had rheumatic fever and that disease ultimately attacked Mum’s heart slowly and deliberately for over 80 years. What this means is that when the operation took place – an operation by one of the best and most experienced surgeons in England – it set off an incredibly rare chain of unstoppable, irreparable and catastrophic events that sadly and tragically led to Mum’s death. In essence, my Mum’s heart broke apart. To put into context how rare this situation was, of the 8,000 operations the surgeon has done, he had only seen it happen on five occasions. As I said, I don’t blame anyone. We always knew there was a risk [initially around 10%] and the reality is if Mum didn’t have the operation she would have had a painful and miserable few months of life until the same sad end occurred. Of course part of me wishes she was still here so I could hug her, tell her how much I love her and put her grandson in her arms but there is also a big part of me that is happy [if that’s the right word] that she died quickly, peacefully and with me by her side because the alternative is unthinkable. Hearing this news made my Mum’s dying official. I know that is mad but there was a part of me that thought – or hoped – she was still around. That she would walk through the door and say “hello”. That there had been some massive mistake and she was waiting in the hospital, wondering why I hadn’t come to see her yet. It has destroyed me all over again, driven home by the fact I collected her belongings from the hospital. A little travel bag and 2 plastic bags. So insignificant and yet so significant. We walked into the hospital carrying those bags together and yet today, I brought them back alone. I can’t open them. I can’t see her pyjamas or her clothes. Not yet. So I’ve rested them on her bed and in some strange way, it feels like I’ve brought a part of her home. A part of her that will forever stay in this house. A part of her that means I will always have somewhere to go to feel close to her. I hope so, because I don’t want to let her go. I am sitting in my Mum’s house. I say ‘Mum’s’, but really it is now mine. But I don’t want to think of it that way, at least not yet. A lot has happened in the past week and I have already entered the horrible cycle of comparison. It started yesterday, as it was a week to the day that my Mum had her last full day alive. And now we have today … the first week anniversary of her death. I’ve been awake reliving every moment of 7 days ago. How I got woken up by a phonecall from some random Chinese number at 1am. How I got up at 5am to ensure I was at the hospital in time. How I stopped for a McDonald’s breakfast as I was going to get to the hospital too early and they wouldn’t let me in. How my Mum said, “I heard your voice talking to the nurses as you came in, it’s so nice to hear it” as I walked up to her bed at 6:45am. How she told the surgeon “she was a bit anxious” when he came to see her. How we had a wonderful chat about so many things. How she saw her grandson on Wechat video chat. How she said the hairdryer she’d been given was so powerful. How the hospital orderlies came to get her at 11am. How I walked with her to the operating theatre. How I cried as she was wheeled through the doors. Till I got the news around 6pm. Things had gone well, but there had been “a complication” in which her heart leaked in a place they hadn’t touched and required 4 bags of blood and the surgeons steady hand to get it back under control. How I was taken to her around 6:20pm and saw her attached to a multitude of machines. How I spoke to her and held her hand even though she was heavily sedated. How one of the machines started bleeping at around 6:40pm – which was the exact moment I was told I should go home and get some sleep because Mum was going to stay sedated till the morning. How I said I was staying and rang my wife to say how scared I was. How a nurse told me to just go to the waiting room while they “sorted Mum out”. How the same nurse came and visited me to explaim they originally thought the bleeping was a loose connection but it was actually because my Mum’s heart had stopped and they were going to reopen her frail, little frame to see if there had been another leak. How my best friend arrived and I fell into his arms and cried because I knew the truth. How I held my fist to my mouth as a surgeon and nurse came to confirm the worst possible news imaginable at 7:12pm. In that 7 days, I have been trying to grapple between grieving and sorting things out. I’ve been blessed with incredible support and acts of friendship but there are still so many things to do … legal things, emotional things, irrational things … all underpinned by my desire to make sure I honour my Mum in the best way possible. And while I only have a limited amount of time to do it all, I find myself with 20 minutes to myself. Not ‘Shanghai quiet’ … but true silence with only the faint sound of the radiators churning out heat, the gentle snoring of my son fast asleep and the odd bird chirping for company. And this gives me the time to express what I’d really like to say to my Mum. Because as much as I am gut wrenchingly sad, I am also incredibly sorry. I’m sorry this operation didn’t work. I’m sorry you didn’t get the new lease of life you deserved. I’m sorry you didn’t get to hold your grandson in your arms. I know the operation had to be done. I know if it hadn’t, your life would have been made slowly worse, but I’m still so, so, so, so sorry it didn’t work out for you Mum. I know you had your suspicions, despite being told you were the ‘perfect candidate’ for the operation. Finding you had re-done your will, written down all your commitments and put aside all your favourite verses for me to find, tells me that. And I am grateful to you. What you did shows you didn’t want me to have to contend with the complexities of death. It shows a level of love I can’t even comprehend … but it also shows me you were anxious and while that makes perfect sense, I am so sorry you had to contend with that as well. You were – and are – an amazing, inspirational person. I cannot tell you how much I am going to miss you. The pain of your loss is incredible and will not be something that fades anytime soon. I know you wouldn’t want me to feel this way, but I would respond by saying it would be horrible if I didn’t feel such sadness. I am just so, so, grateful I was there, you knew I was there and you didn’t suffer. If there is anything good I can take away from the painfully dark day, it’s that. There is one last thing you should know. We moved into the house on Saturday. I use ‘moved in’ very specifically because while we will be moving back to Shanghai in a few weeks, we wanted the final chapter of our home to be one of family. I know how much you wanted to hold Otis in your arms and while we didn’t manage to make that happen, the fact we are all here – living as a family – is something, I hope, you would love. We’ve taken Otis all around the house and told him various stories about what went on here. We’ve shown him photos and paintings and even put him in your bed for a moment so I could feel you were giving him the cuddle you so desperately wanted to give him. We’re all sleeping in my old bedroom – the one you recently redecorated because you wanted it to be “just right” – and it’s lovely. We’ve turned the top of one of my Marshall amps into a change table. We’ve bought a special contraption to make sure Otis can’t fall out the bed and we’ve filled the fridge with food. It’s wonderful. I cannot tell you the amount of times I’ve said to Jill how much you would have loved to see this scene. And while that makes me feel incredibly sad, I can tell you that a 3 month old baby smiling and gurgling is the best way to lift the cloud of darkness. He might be small, but he is literally filling the house with happiness and life and I know that would please you immensely. We would have moved in sooner, but Angelo was fixing the new central heating I’d ordered so the house was a mess all last week. The good news is he finished on time [surprise, surprise] and the house is warm and wonderful. The bad news is the [new] shower now doesn’t work so you were right when you said that “sometimes he is a bit sloppy”. Oh Mum, I miss you so much and the next few weeks will be one of even greater turmoil but I promise you I will do everything I can to honour your views and beliefs. I will always be eternally grateful for everything you showed me, gave me and said to me … you were and will continue to be, an enormous influence in my life and I will ensure Otis always knows how much he was adored by you. If there is anything beautiful to come out of all this, it’s that you have given me 5 uninterupted weeks with my son … a chance to spend every minute with him while surrounded by the people I love. That is a wonderful gift and I will remember it and treasure it forever. I love you my dear Mum. I’ve been part of this house for 44 years and seen this view tens of thousands of times and yet only now, as I enter the last few weeks of belonging here, do I truly see its beauty and can honestly say I will miss it with all my heart. For the record, I’m not going to sell the family home, instead I’m going to rent it at a low cost to a young family who would otherwise not be able to afford to live in the area so they – like my parents – can raise their child in a place that can help them have a better chance in life … with the only stipulation being they must care for my parents garden with the same adoration they gave it. I hope my Mum & Dad would approve … the reality is this view, this house and my memories are too strong for me to just let go. ﻿So obviously this has been one of the hardest weeks of my life. Hardest and most horrible. On top of the pain and trauma of losing my Mum and having to make decisions that directly impacts my history and future … I’ve been fucked over by those bastards at HSBC [again] as well as needed an emergency root canal. But through all the pain and horror I’ve gone through in the last few days, there has been some light. Of course having my wife, son and closest friends near me has helped enormously. Part of me wanted to just run away, roll into a little ball and cry and cry and cry … and while they have all encouraged me to grieve openly and proudly, their love, laughter, smiles and – in the case of my son – innocence has helped me see some glimmers of light amongst all the darkness. They’ve been amazing. Everything you want to be true about Wieden+Kennedy is. They are people who care, genuinely care, and their compassion and understanding for what I am going through has been both comforting and breathtaking. A few days ago I wrote about how technology is making death harder for me to compute. How the constant reminders of my Mum’s presence in my life was both a blessing and a curse. And I still feel that, I truly do. But it cannot be denied that technology has offered me something else in some of my darkest days. Not just in terms of being an outlet for me to express all I am feeling but that it offered me a chance to see how many people cared about me and cared about my Mum. In all honesty, I’m overwhelmed by the outpouring of support I’ve received over the last 5+ days. People I know. People I know but have never met. People I don’t know and have never met. It’s been both amazing and unbelievably comforting. I appreciate death is an awkward subject to discuss because no one can say anything that makes it better and most people are scared of saying something that makes it worse – and that is why I’m so touched by how many people have thrown aside concern and reached out to me in messages, comments and texts. I have honestly appreciated every single word. Every one of them. Of course I wish you didn’t need to write them but I am overwhelmed with what I have received. I am aware that as a 44 year old man – and a father to boot – I should be strong to tragedy at this point in my life … able to face adversity with strength and stoicness but I’m not. I’m a weakling. I have cried rivers of tears and howled in emotional pain over and over again. I have done this both in private and, embarrassingly, in public as well. I feel totally destroyed and shocked. I still can’t believe this has happened and feel that I’m living in either a dream or some weird parallel universe where on the other side, the other version of me is visiting my mum in hospital who is recuperating well from a successful operation. It is all too complex and confusing for me to grasp and when you take into account that I need to decide what I’m going to do with my family home – a place where my dads ashes are scattered – the weight of expectation and pressure feels almost overwhelming. And yet I am – in my own way – getting through things and a big part of that is because of all the love, support and compassion that has been thrown at me. Frankly I don’t know what I’ve done to deserve it. I know what my Mum did to deserve it, but not me. And yet people’s generosity of support has been amazing and I’m genuinely humbled and feel cared for by it all. Media likes to present the World as a cold and miserable place. Where selfishness is the norm. They are wrong. The World is full of kind and caring people and I have been fortunate to experience this first hand at a time where I felt my whole World was collapsing around me. So thank you to you and the people who made the technology that allowed you to reach out me. Of course it doesn’t take all the pain away, but it stops everything looking so bleak and I can assure you that would be exactly what my Mum would want for me. Thank you Otis for putting a smile on my face even when the tears are falling. Thank you for distracting strangers from seeing my agony by endlessly smiling. Thank you for inappropriately lightening the mood when I’m in danger of collapse. Thank you for showing me your wonderful Mum can be even more wonderful. Thank you for being the person who made my Mum’s last 3 months so joyful. Thank you Otis for being mine.